It will be on when I’m not using the radio, generally during the day and overnight with the band changing between 30m and 40m depending on how I feel. If there are periods of activity when the Knights QRSS members decide to congregate on a specific band, I’ll move to that for the period. I’ve said before that I’m finding this low power propagation study work fascinating and this is my way of giving back to the community. Grabbers are always useful and it’s very easy to set one up. This is a sample grab from earlier today – How many callsigns can you spot there? 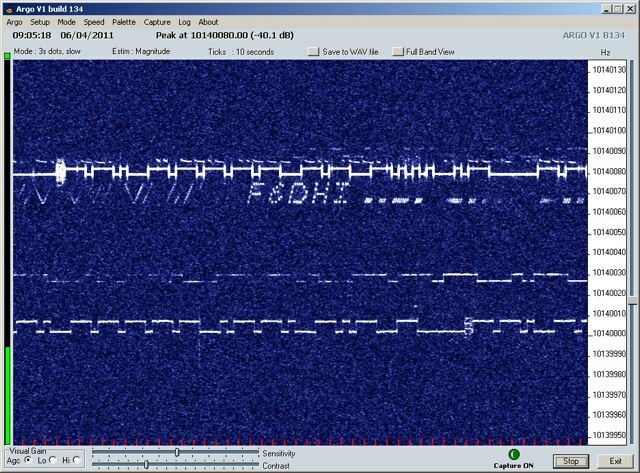 G6NHU’s occasional QRSS grabber can be accessed by clicking here. This entry was posted in Amateur radio, CW, HF, QRSS. Bookmark the permalink.